This tactic has been built to be a lower intensity tactic while still being effective. The Wingers job is to simply provide for the strikers, the strikers on the other hand have a multitude of things they should do, they are set to False 9 to close up the game between your midfield and the attack while being more mobile than the Deep Lying Forward. Esta táctica foi construída para ser uma tactica de baixa intensidade ainda mas continuando a ser eficiente. 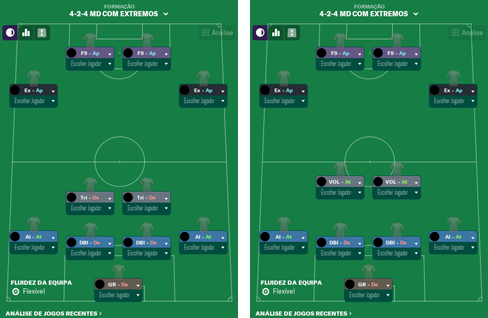 Os Wingbacks sao a força criativa da táctica, especialmente na versão Anchor, na variante Volante o meio campo levará a bola para a frente enquanto na outra variante o meio campo será mais ignorado.